January is one of my favorite months. Not only is it my Birthday month, I also love the new beginning feel this time of year! It’s pretty easy to get into a less than perfect groove over the holidays but it’s also pretty easy to get back to healthy eating once all of the parties have passed. One of the easiest ways for me to enjoy more nutritious snacks is by making smoothies! This is also the easiest way for me to encourage my kids to eat well too. Smoothies are magic. 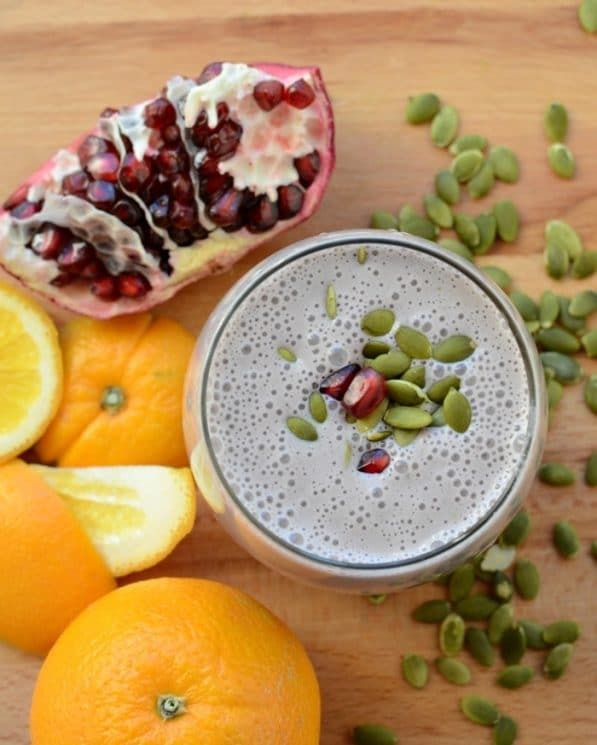 This Healthy Pomegranate Orange Smoothie is sure to become a fast favorite. I’m a huge smoothie fan. 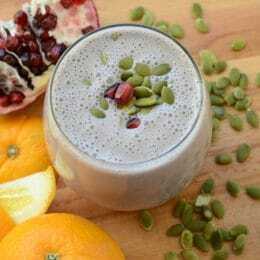 Today’s smoothie features some of my all-time favorite ingredients. Pomegranates are one of my favorite winter fruits. They grow well in Southern Utah and I can even find them locally sourced, in fact, my brother-in-law has a pomegranate bush in his backyard! How cool is that (they are pink inside instead of the more commercial red though)?! 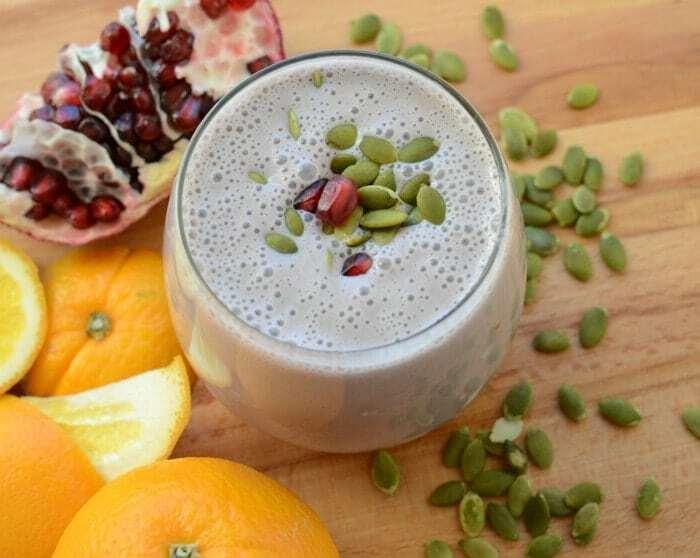 Pomegranates are loaded with vitamin C, potassium, and fiber. Plus they are sweet and beautiful. This is the easiest way we have found to get all of the seeds out of a pomegranate. Oranges are in season right now too. Look for oranges that are bright in color and feel heavy for their size. The easiest way to peel an orange for a smoothie is to cut both ends off with a knife and then run the knife along the edge, under the skin. It’s ok if some of the white pith is left; you’re just blending it up anyways. I love to use oranges as my smoothie sweetener this time of year. Pepitas are hulled pumpkin seeds. 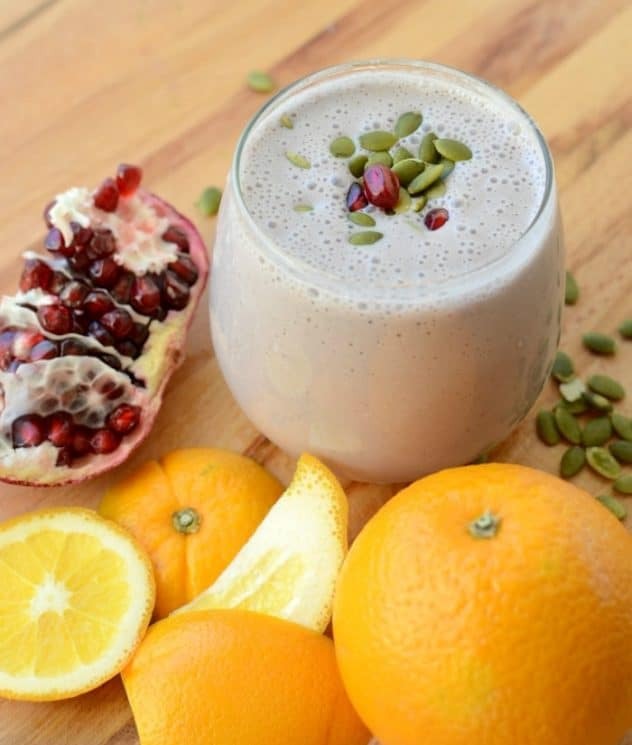 They aren’t as traditional in a smoothie but you are going to love them. Pumpkin seeds contain healthy fats as well as protein, fiber, potassium, iron and zinc. I like to buy them raw and unsalted in the bulk bin section (best option for smoothies) and they are also a great addition to salads, trail mix, and homemade granola. You can use just about any milk you’d like for this. I’m digging the creaminess of cashew milk lately but almond, coconut, and even traditional cow’s milk will work for this recipe. Don’t skip the ice; smoothies aren’t very good unless they are really cold. I always like to make a big serving of smoothie and then freeze part of it into popsicles. My kids eat popsicles year round and it’s a simple way to get some more real food goodness into their bodies. Enjoy this recipe from my kitchen to yours! Melissa cooks, confesses, and corrals chickens and children at Bless this Mess, where you can find healthy recipes (with some simple desserts included), a peek at her hobby farm, and the joys of raising five little ones, eight years old and younger. She’s got a whole lot of mess to bless! Anyone else Instagram obsessed? Add all the ingredients to the jar of a high power blender and blend until smooth. Enjoy right away. Any leftovers made great popsicles. Serves 1. It was okay. My son didn’t like the texture.